The Goodie Monster is here! After a good idea, some sweat equity, and a few technical hurdles my friend Mark and I have brought into this world a new kind of vending machine. It looks a little different, and tastes different too. Mark came to me with the idea of the Goodie Monster in the summer of 2011 and asked if I would help make it real. The goal: to put good food within people’s reach. The location: the Goldsmith Building where we both work. The details: make it the most awesome vending machine ever. I am a voracious snacker and quite interested in food (as evidenced here, here, here, here and here), so I took about 30 seconds to think about it before committing to one of the bigger side projects I’ve done. Fuzzy type was the first inklings of our Monster-to-be. 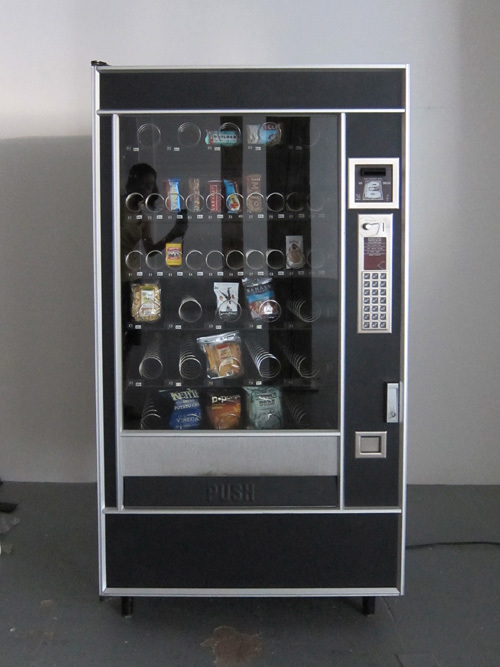 After a failed attempt at getting onto Kickstarter, Mark took the plunge and bought a vending machine out-of-pocket. Yes, you can do that. He also researched what kind of snacks to put inside and put together an informational site that has details about each snack in the vending machine. Did you know that Luna Bars were created for women but can be equally enjoyed by self-confident men? A selection of snacks that the Goodie Monster approves of. My end of the deal involved giving the machine a personality, which included buying various materials at Fabric Depot, the largest fabric store in the nation. They must see a lot of strange things come and go, but even the ladies at Fabric Depot raised their eyebrows at my purchases. One check-out person saw my 5 pound box of polyfill and commented “Looks like quite the project you have going there”. You have no idea lady, that’s just for the tail of it! Once we got started, the Goodie Monster took shape pretty quickly. He didn’t really have a lot to say, but he was very excited about snacking. In fact, all he could utter was NOM NOM NOM and point towards his mouth. Very demanding. The Goodie Monster says it all with buttons. He lives somewhere on the way to Snack Mecca where pears fly south for the winter. 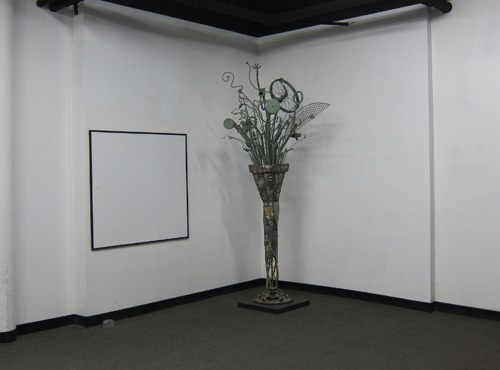 This project was challenging in numerous ways. Mark had never owned or operated a vending machine. I had never sewn 12 yards of fake fur. My sewing machine was from the 1970’s and didn’t like working overtime. Fabric Depot was located in deep Southeast Portland next to some strip clubs. Things could have gone wrong in so many places, but we made it through fairly unscathed. Here are a few pictures showing the process from start to finish, including having our first customers arrive 30 seconds after the Goodie Monster was unveiled. The door wasn’t even closed and they were already clamoring for their Justin’s Nut Butters and Larabars. He lives somewhere on the way to Snack Mecca in a mountainy region where pears fly south for the winter..
Mark and I doing our best “I love what you do for me” jumps. Hurrah! 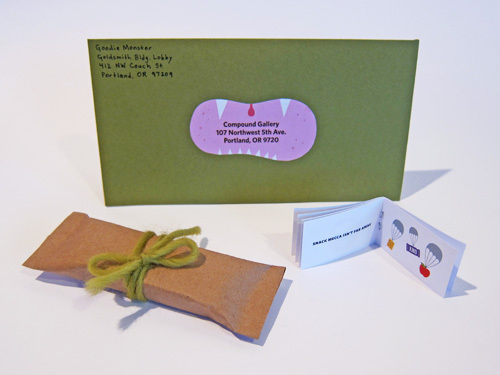 To announce the Goodie Monster’s arrival, Mark gave each tenant of the Goldsmith Building a small Kind bar with a booklet introducing their new neighbor. Other businesses in the area got a note in the mail that came in a very hungry envelope. Many people helped us with the Goodie Monster: Darin Richardson who painted and painted and painted, Jen Stevenson who gave us the idea for a GORP recipe card, Jelly who repeatedly yelled WOOHOO and gave constructive feedback, David who owns the Goldsmith and encouraged us to make it happen, and Greg who helped when the Goodie Monster went haywire and started spewing coins and Clif Bars unprompted. To all of you – THANKS! Mark and I doing our best "I love what you do for me" jumps. Hurrah! Update 11.15.2011: The Goodie Monster gets a four course review by local food writer Jen Stevenson of Under the Table with Jen. With almost 40 courses to choose from it was a tough job, but less filling than your regular Thanksgiving dinner. Read more about our snack sampling. Update 11.23.2011: The Goodie Monster is now on Facebook! Where else is a vending machine clad in green fur supposed to find friends? We hope you like him. Update 11.25.2011: Steve Law of the Portland Tribune has written a nice article on the Goodie Monster and vending machine policy for the Thanksgiving issue of the newspaper. Update 11.29.2011: Portland Pulp wrote a nice blurb about our friend called “The Goodie Monster: The Future of Health Food”. Check it out here. Update 01.01.2011: Portland’s Chinatown newspaper featured the Goodie Monster as their “employee of the month”. Pretty amazing seeing as the Goodie Monster just sits there and sells snacks with a smile. Update 01.02.2012: The Goodie Monster gets a mention in Mix Magazine alongside another vending machine makeover case, the Soda Pagoda. Update 01.27.2012: Making more Goodie Monsters has been accepted as a project for Kickstarter. Plans must now be formulated – stay tuned! 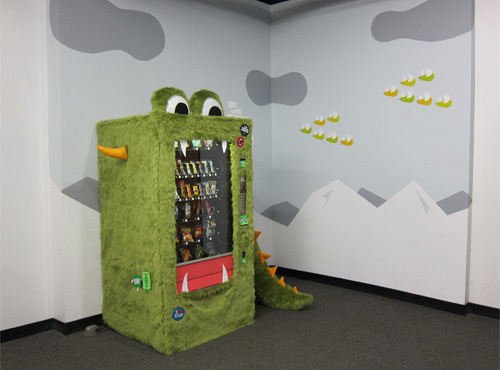 Update 03.31.2012: Portland Monthly Magazine wrote a short article on the Goodie Monster, saying is a vending machine “with more personality than most, or maybe any.” Why yes, it probably is. Update 04.29.2012: The Goodie Monster Kickstarter campaign has officially started. Help us raise money to make four more Goodie Monsters, which will be the start of creating and sustaining continued growth for the Goodie Monster family. Check our our video and rewards on Kickstarter. 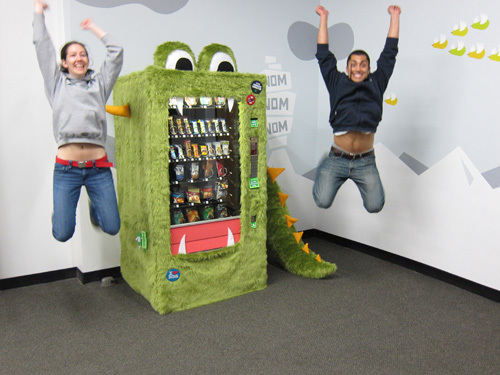 Update 05.01.2012: Silicon Florist blogger Rick Turoczy picks up on the Goodie Monster campaign in the article VendScreen and Goodie Monster: Could Portland be the epicenter of vending machine innovation? You are amazing!!! one day you will take over the world with your crazy ideas!! G is for Goodie…that’s good enough for me! You continue to be the coolest person I know. This is astonishing and I love it. Yet again Mette you amaze me. I love this. I must come visit! The apartment complex I live in totally needs a Goodie Monster. It’s vending machine has off-brand Twinkies & Oreos. Bleh! So how about a list of what different and better snack foods Mr. Goodie Monster offers? Hi Zab – all of the snacks (and their nutritional info) are listed on http://www.goodiemonster.com and include Kind bars, Clif bars, Luna bars, various dried fruits, Justin’s nut butters, Pop chips, and some nut mixes. The machine is not refrigerated so all the snacks have to be room-temperature storable and non-perishable. INCREDIBLE job! Super impressed and want to nom nom nom my way through ALLL the snacks! This is completely, totally, and utterly AWESOME! We need one of these for our studio right away! You inspire me on so many levels! Such a great idea – making the mundane fun. Love this!!! Mette…I see a franchise in the future. This is an awesome idea and all involved are to be praised. You are such a fabulous daughter-in-law! May this monster make babies, and bring you the real kinds of wealth: the wealths that come from enhancing the world! Jeg støtter alt som har uhdyre i. Flot. To everyone involved, I love it. creativity put to good use.